Two prominent United States politicians have said things relating to the Bible that are still reverberating throughout the media. Undoubtedly, these statements are in harmony with the religious right wing of the Republican party, a significant group of would be voters. What other motive could there be to say such things? Ben Carson is the currently leading Republican candidate in 2016 presidential elections. In 1998 he told in a graduation speech in Andrews University that Israelis built the great pyramids as grain silos under the guidance of Joseph. He still believes so today. 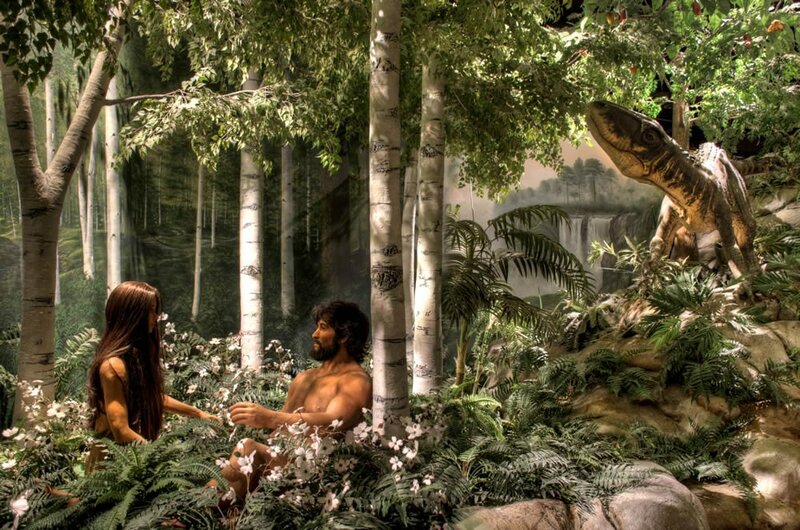 depicts Adam and Eve in the Garden of Eden with a dinosaur. The 9th governor of Alaska, Sarah Palin, was the Republican Vice President nominee in 2008 elections alongside Arizona Senator John McCain. After conducting a college band and watching Palin deliver a commencement address to a small group of home-schooled students in June 1997, Wasilla resident Philip Munger said, he asked the young mayor about her religious beliefs. Palin told him that "dinosaurs and humans walked the Earth at the same time," Munger said. When he asked her about prehistoric fossils and tracks dating back millions of years, Palin said "she had seen pictures of human footprints inside the tracks," recalled Munger, who teaches music at the University of Alaska in Anchorage and has regularly criticized Palin in recent years on his liberal political blog, called Progressive Alaska. These two US politicians with presidential ambitions, Ben Carson and Sarah Palin, are honestly expressing what they believe. At the same time, by making such statements they hope to increase their popularity among the Christian believers in the Republican electorate. Such tactics indicate that their opinions about biblical matters must be quite widespread among the American public. How come? The ignorance about the real contents of the Bible and God's creation can only be explained by the lack of proper education. US public and private schools do not give American children proper Bible teaching. This black hole in "religiously neutral school system" leaves the youth vulnerable to all kinds of religious groups educating them outside the perimeters of the schools operating under Federal and State legislation and teaching programs. The US national failure of teaching the Bible properly has truly catastrophic spiritual consequences. The tip of the ice berg are statements by well meaning election candidates whose statements cause world wide mockery to the holy name of the God of Israel.